While you’re cooped up in the house staying warm, you’re going to want some yummy treats to snack on while you wait for the world to thaw out. There’s always my perfect salted caramel hot chocolate to sip on, but what about something sweet and warm to munch on? Two great and easy to make options are Lucky Star Sugars Cookies and Apple Streusel Bread. Yet again Lucky Leaf has come to a learning baker’s rescue when it comes to baking up some delicious, sweet treats. 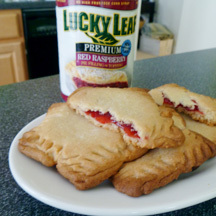 This season we’re baking with Lucky Leaf Premium Apple Pie and Raspberry Pie fillings. We’ve baked with the Lucky Leaf Premium Apple Pie filling before, and are already big fans. This was the first time that we got to bake with the raspberry pie filling – and since I’m not the hugest raspberry fan, it was a toss-up to see if I would like it as much. Baking these stars reminded me of when I baked cookies as a kid. Something about using a cookie cutter just throws you back to childhood. Only this time I was a lot more diligent about making sure the stars came out right. The recipe was easy to follow (as usual,) especially since you can use a premade sugar cookie dough like I did. If you have an awesome sugar cookie recipe, you can use that instead (and send it to me too, please!) 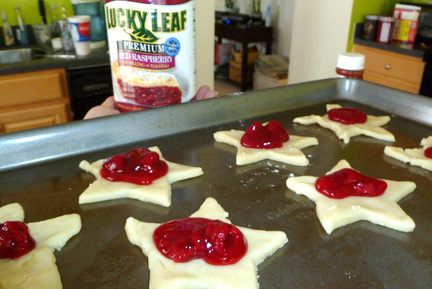 After you have your dough rolled and cut, put a dollop of the Lucky Leaf Premium Raspberry Pie filling in the middle, top with another dough star, seal with a fork, and bake! Once baked, I’ve got to say – they were good! 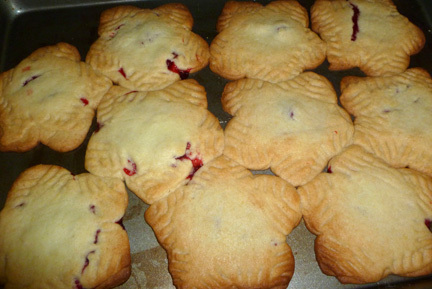 The raspberry filling wasn’t too sweet or too tart and went perfectly with the cookie. As a true testimony, some friends came over later to visit, and by the end of the visit, every.single.cookie was gone. All I remember was someone asking, “Are the cookies up for grabs?” and it was over. The Apple Streusel Bread had a few more ingredients and steps to it. My first milestone was having to create my own apple pie spice. How can grocery stores not carry this essential spice? I even ground up my own allspice…with the back of a spoon and a bowl. Yes, that’s how the baking process started for me. This recipe uses both Lucky Leaf Premium Apple Pie Filling and Musselman’s Apple Sauce. I’ve never baked with apple sauce before but I’ve decided that apple sauce adds some great moisture to help keep your baked goods from being too dry. I don’t think it added too much sweetness to it. 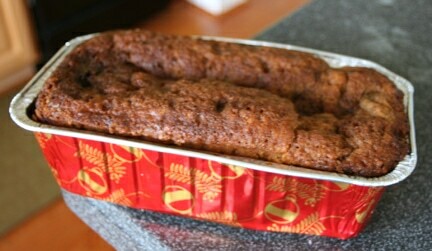 In fact, the recipe only had 3/4 cup of brown sugar, which gave the apple flavors the opportunity to shine. I’m not sure how it’s supposed to look, but this is how my Apple Streusel Bread came out. I think next time around I will add the chopped walnuts on top which were optional. Do you remember the friends who ate all the cookies? Well, this recipe made two loaves of Apple Streusel Bread and in one night an entire loaf was gone. They thought that it was delicious and tasted like it came from a gourmet bakery. (Don’t think my kitchen has been called that before.) The apple flavor was great and I loved the whole apples that were contributed by the pie filling. So again, we’d like to recognize and thank Lucky Leaf for making delicious pie fillings that can be used for many a baking need. For these and other great recipes, make sure you check out the Lucky Leaf website.